Today's topic for Top Ten Tuesday hosted by The Broke and the Bookish is a freebie so I decided to visit my dusty shelves and list the top ten books that catch my eye. My bookshelves are overflowing but regularly get ignored in favor of new shiny releases or ARCs. After my recent visit I'm definitely going to have to start getting more use out of them. It was hard to narrow it down to 10! 1. 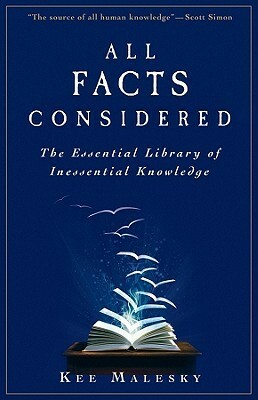 All Facts Considered: The Essential Library of Inessential Knowledge by Kee Malesky - I first heard about this book in an interview on NPR. Malesky is a librarian at NPR and is in charge of answering pretty much every question that comes up. 2. The Widows of Braxton County by Jess McConkey - City dweller Kate is ready to put down roots when she marries Joe Krause and moves to a small farming town in Iowa. She's not expecting just how hard it will be - between the work, the mother-in-law she was unaware that she would be living with and long hidden secrets. 3. The 8:55 to Baghdad by Andrew Eames - When recently divorced Agatha Christie needed a vacation she found herself traveling on the Orient Express. In this look at the writing of one of her most famous books Eames merges biography with travel adventure! 4. Hats and Eyeglasses by Martha Frankel - Frankel's memoir about growing up in a family of gamblers. It looks both funny and heartwarming. 5. Can Any Mother Help Me? by Jenna Bailey - In 1935 a young mother wrote a letter to a magazine expressing frustration and asking for help. Dozens of women wrote back. This is a collection of their letters and personal stories. 6. 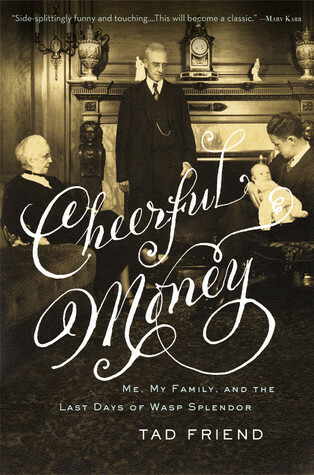 Cheerful Money by Tad Friend - A look into the family secrets of the author's illustrious family. I love family secrets! 7. Cloche and Dagger by Jenn McKinlay - This is the first in the newest series from McKinlay. Florida resident Scarlett Parker leaves her life behind her to move to London and work in a hatshop with her cousin, Vivian Tremont. The future looks bright on arrival except that Vivian seems to be missing and a client has been murdered and wearing a custom made cloche hat. 8. Mind Over Murder by Allison Kinglsey - Ana Jordan has made no secret of her feelings about The Raven's Nest Bookstore so when she's found murdered by an Edgar Allan Poe bust it's up to cousins and bookstore owners Clara and Stephanie Quinn to find out what happened. 9. When She Was Wicked by Anne Barton - Dressmaker Annabelle Honeycote overhears the steamiest of secrets and has no problem using them to her own advantage as long as she follows her own rules of course. Until she runs into Owen Shelbourne, Duke of Huntford. 10. The Murders of Mrs. Austin and Mrs. Beal by Jill McGown - Two murders and two very complicated victims. It's up to newly promoted DI Judy Hill and DCI Lloyd to sort it all out. What fascinating books are collecting dust on your shelves? Okay, I have to add a couple more books to my pile. Aside from a great title, Mind Over Murder is about a bookstore! Who could not like that! Right! I can't resist books set in bookstores and libraries! This is such a fun topic! I should do that. I have so many unread books, too. I haven't read any of these! There's so many books crammed in my shelves but if don't get to them nearly as much as I should! Oh man. So many books need a dusting. I just did a somewhat big clearing of my TBR. Got rid of about 150 books. But it's not all that much in the end. Do you constantly look at your shelves and thing why haven't I read that book yet? Or that one? So overwhelming. P.S. Re-watching all the Sherlock episodes is not a bad thing. I feel like the year will be full of re-watching them. :) You'll love the last episode. Let me know when you get to it. Yes! There's so many books I just absolutely had to have and than haven't read. I see a Sherlock marathon coming up soon! Serves you right after all the damage you've done to my TBR! There was an article in EW the other day about Agatha Christie (and how to binge on her books). I thought of you. :) And learned a lot! I didn't realize she had two different main detectives and it also included fun facts about ways she likes to kill off her characters. LOL! Anyway, Can Any Mother Help Me? sounds fascinating. I would love to see the responses that mothers gave in the 1930s. I'll have to look for that article! I have a few weeks worth of EW piled up so I have it somewhere! I'm really curious about Can Any Mother Help Me. I forgot how much I wanted to read it until I pulled it out the other night. I'm afraid to look at what great books are sitting, just waiting for me on my shelves. It just gives me all the guilts! I think the The 8:55 to Baghdad sounds fascinating. I could have made a top 100 list and STILL have more! I know what you mean about the guilts. All the books! I need to do nothing but read for years! I always have to open up Goodreads and the library Overdrive whenever you talk about books. I've added #7 & #9 to my TBR. Oh thank you! I hope you find some you love! Jenn McKinlay is one of my favorite cozy authors. I love her library series especially. I officially am not really familiar with any of these. So, I guess I need you to read them and add to my TBR. LOL! Hopefully I'll get to them soon! Go right ahead! I found several books that I had forgotten I even had! I don't know these books at all but they sound good. You should read Jen McKinlay Yvonne! I think you'd really like her books - especially her library series! Cheerful Money sounds really interesting, and I love that cover. Great idea for this week's post! The cover got me too and it just sounds so interesting! What a great idea! Sometimes I like to wander by my shelves slowly to see what books pop out at me. If only e-books weren't so much more convenient, I might make better progress through them. I don't recognize most of the titles but they do sound good. Especially The 8:55 to Baghdad by Andrew Eames. This made me realize how many books I have that I really want to read. I do tend to read Ebooks more too though. I like your idea! It's like going shopping in your living room, looking at the shelves and selecting the "new" ones you want to read. So many interesting titles that I never heard of...thanks for that. My TBR pile is groaning so I'm hoping to share the wealth! It's fun to shop your shelves! I have so many books I can't believe I haven't read! Pretty much all of these were books were ones I had to have and have been sitting on my shelves for minimum of 6 months! Crazy! Let's see, I've read #2, #7, and #8, and enjoyed them all. The Widows of Braxton County was especially good! Oh good! I haven't heard much about The Widows of Bracton County. So I'm glad to hear you enjoyed it. I hadn't heard about All Facts Considered - gonna have to keep an eye out for that one! I'm looking forward to that one! I heard an interview with the author right after it came out and it was really interesting.